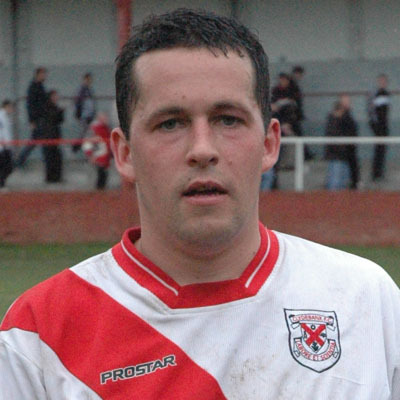 Clinton Maxwell was one of Budgie McGhie's earliest signings for the Bankies, joining the club in the summer of 2003. Clinton was a popular figure with the fans, even earning the accolade of having his own song. Although not the tallest, Clinton was excellent in the air and scored a number of vital goals for the club with his head. In his four seasons with the club he scored 39 goals. This tally would have been much higher, but Clinton never seemed to be able to be the managers preferred choice as striker. This was evident in Maxwell's middle two seasons when he was continually squeezed out of the starting 11 by a procession of strikers who failed to hit the back of the net. Whenever Maxwell was recalled, he would respond by grabbing a goal, only to lose his place again. It was only in his final season that Maxwell would regularly lead the attack. Any fair assessment of Maxwell's time at the club would say that he was left out too often for inferior players. He may not have been a prolific scorer, but he was head and shoulders above the other players vying for his position. At the end of the 2006-07 season Clinton left the club for Rob Roy and later moved on to Renfrew.